Parathas! An Indian food aficionado’s most favorite recipe..
Sumilarly the Gobi Parathas, dal ,Gajar and now a days of course the multigrain versions of the parathas are a rage too.And then while these are supposed to be oily,it really doesn’t need that much of oil..
Of late the Gajar(Carrots) parathas have been quite frequently appearing in my kitchen for the health benefits of carrots that it attracts.Carrot of course has its nutrient and vitamins in place as it contains vitamin A, a very essential for bones and and good eyesight.Hence there is a conscious effort on my part to include Carrots as a part of my regular diet be it in salads or perhaps as a paratha. While personally I am not too fond of carrots as a Cooked Vegetable or when the monotony of the same carrot salad evokes a diabolic disregard for the carrot ;that is when I make these Parathas with just minimal oil.Yes, Parathas can be made with just a spoon of oil as well..my mother even makes them with olive oil,however I try and adjust just half a spoon of either refined oil or ghee perhaps..it really doesn’t need too much.. 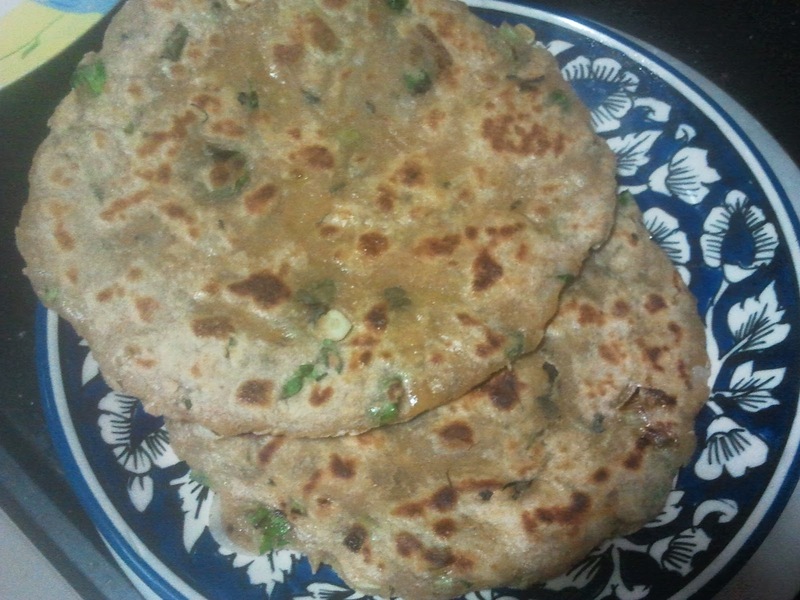 Most often there are two styles or techniques of preparation of a Paratha .While authenticity reeks in the stuffed version,yet for the ease of making,many a households make some of their Parathas especially Gobi( Cauliflower/Cabbage) ,Palak (Spinach),Dal (lentils),gajar(Carrots) as a mix that blends with the wheat flour dough..technically the stuffing or the mix is blended with the wheat-flour and made a dough..no stuffing..
That’s an easier way and equally delicious too..however the original stuffed version of Parathas are the quintessential one..the ones that give you bliss and are indulgent is my opinion. Absolutely brilliant and scrumptious,these can be your full meal..the stuffing gives out a beautiful flavor and taste that blends do well with the base of the Paratha ..since i often tend to put more then a generous amount of stuffing,it almost oozes out at times making it even more yummy..slightly spicy tangy and the sweetness from the carrots moves over to the overall taste making it one of the most satiating and healthy Parathas. A full meal or your anytime snack i would say..either as breakfast lunch tea time snack or dinner..the heath benefits of carrots intact this is a great way to break carrots into your daily routine if anyone esp kids abhor the sight n taste of carrots ..just with some pickle and curd or a bowl of Chole ( Chickpeas)these are perfect fir your meal..my grocery bag now often has carrots in the.Am sure they will show often more in your larder of kitchen reserves too once you try these amazing Parathas once. Laccha Parathas or layered parathas as they can perhaps be called ,for better use of English vocabulary; are one of the most loved Indian flat breads. Flaky and incredibly soft, with a certain sweetness ,they add a finesse to your overall meal with the perfect blend of visual appeal, flavor and drama. These palak laccha parathas are a twist on the regular laccha parathas with the addition of Palak Puree. Be it with a sabji or a bowl of succulent chicken pieces, laccha parathas are a perfect accompaniment to your meal . Yes, while on health grounds, the inclusion of refined flour doesn’t add to any benefits, but yet, on a certain occasion, keeping the calorie counts at bay, these offer the most amazing culinary experience when paired with your overall Indian curries. For healthier benefits i most often add equal amount of maida and atta(wheat flour) ,the taste remaining equally delicious. Trying to add a creative twist to the regular paratha,this time I decided to add some palak(spinach) puree to it and made some beautiful palak parathas. While palak parathas are a common feature in my kitchen and perhaps many Indian households too, however I havent really tried my hands on a Laccha Paratha often, very rarely infact.Palak is a regular feature in my grocery bag generally, not because of a profound love that exist within me towards this leafy vegetable but for its health benefits,but for its high contents iron and mineral contents. Be it dal, or rice or rotis, I definitely try and add a flavorful twist with the addition of palak. A healthy option developed out of the erstwhile laccha parathas with the addition of fresh palak puree, the flaky texture gives it a beautiful visual appeal . Paired with your regular subji , these are perfect to delight your taste buds.The palak(spinach) isn’t really that domineering and imparts a mild undertone of its flavor that gives a perfect taste, while the flaky texture is an absolute delight that is irresistible to not dig your hands into. Pleasantly overwhelming I would say.Once you get the technique of the layers right, its incredibly easy churning out these flaky parathas . A discerning texture and exquisite flavor, they would feature in your list of favorite Indian flat breads ,the moment you try a bite,is my guarantee. So what are you waiting for? for the love of healthier options and the right balance of nutrients ,these parathas act as the definite elements of your scrumptious meal packed with a powerhouse of energy and nutrients. Palak laccha Paratahs are spinach parathas but amde in the laccha or layers style. Also called as layered parathas or kerala Paratahs, these are mixed with the nutrients of Palak(spinach leaves) to lend a beautiful greenish hue. Make thick balls out of it. Roll out one ball into a flat roti around 8 cm in diameter. Now make folds like you make for a paper fan. Check the image for the exact way. Now roll the ball again into a thick paratha. As you roll out you will see the layers forming. Place on medium flame and cook on both sides applying ghee regularly until done. Sattu, the quintessential element of bihari cuisine, a staple ingredient that which is slowly achieving a stature of a premium level, with its sattu drink, highly promoted as a healthy ,energizing drink for its protein content these days. But for the common man from Bihar, Sattu signifies the lifestyle and an example of staple bihari cuisne, authentically rooted to its culinary dictionary. My friends from jamshedpur in college possessed their own bottles of sattu powder that they would carry back from home after vacations. It was considered healthy and refreshing even then but possibly not known as much to the world about its benefits. Now with health topics taking immense coverage on the internet, magazines and media, the sattu drink has suddenly catapulted itself to being a fancy healthy drink. Baring a drink,the most common dish that constitutes a mix of sattu is the sattu paratha that which is a gastronomic delight from Bihari cuisine. Extremely simple, yet the mix of sattu is unique in taste and exquisite only to the food of Bihar. Not heard anywhere else across the country , this is their very own dish, which achieved its popularity in the State. For the unknown , sattu is a powder made from roasted chana gram.I love the taste of the sattu mixed with the raw mustard oil, as it behaves on similar patterns like the food habits of the eastern part of our country especially Assam and West Bengal,where the use of mustard oil in regular dishes is very common , Hence for me the taste warms up to my taste buds, having my origins back in the eastern belt of the country. While earlier it was a near impossible task to get the actual sattu powder anywhere across the country apart from Bihar, itwas impossible for people like us to even try our hands at a paratha,. It was only , the bihari friend / colleague who had to be coaxed into getting a homemade sattu paratha to satiate our taste buds. However, I was pleasantly surprised to see a readymade pack of sattu powder at a nearby grocery story that nearly made me smile with glee as I finally achieved the impossible task of getting my hands on a packet of sattu powder. Quickly , I set off to try my hands on these beautiful parathas. Mix all the ingredients for the filling with a little water and bind it to form slight crumbs. Now make small balls of the dough and flatten them slightly. Take each ball and roll them out slightly. Fill the flat balls with some of the filling. i usually fill in as much as the size of the ball so as to have a filling paratha. Unique and explicit with a slight piquancy of the mustard oil, it gives you a punch. Dry, pungant and piquantly flavored , the onions imparting a crisp texure, it creates a great meal. Sattu , being a little heavy , has the capacity to satiate you to the fullest. If you havent tried yet, then its time for you to fill your grocery bag with sattu powder. An uninitiated taste perhaps, yet unique and flavorful, well crafted to form a great blend of taste to your regular parathas. As a snack, its falls into the category of healthy options of food, with the numerous benefits of the chana gram flour, while if you want to relish it like the Bihari community does, a bowl of baingan ka bharta(a dish representing roasted brinjals, mashed and fried) does justice to your overall meal. Aloo Kulchas! They are my favorite Indian breads on any eating out session especially if it’s an Indian meal .Know not why, but the taste, texture really appease me more then any of the other Indian breads, even more then its cousin; the Naan. Although like many people I still am not sure of the thin line of difference between naan and the kulcha/. Both are celebrated indian flatbreads with Naan being the commercially more popular one amongst the two, yet majorly, both of them are similar in the making.In fact many make it the same way at least when they make the naan without the yeast version. And from the kitchen directory of rules , naan ideally is made with yeast while kulchas does not need yeast but uses baking powder and soda. For the health conscious souls, these kulchas aren’t an exactly healthy option , the base being made of white flour, hence most often I substitute it with whole wheat flour .Whenever I feel my taste buds needs to be satiated with something exciting, away from the monotony of the daily dose of chapatis, these kulchas are my best option to liven up my dining table. I have adapted the this kulcha recipe from www.veg recipesofindia for the base. Made my own filling though and added a little onions for the crunch. Beautiful and gorgeous with a professional touch these are almost like restaurant bought kulchas. When monotony of the same rotis in your daily meals hit boredom, these are a great savior and can lift even a very boring meal just with its taste. Its own taste has the capacity to even camouflage a not so interesting subji perhaps, so much so that I love having them on its own as well.But for a convert to a luxurious meal at home, la restaurant style, these are the perfect choice to go for. Aloo Kulcha is a delicious Indian flat bread like aloo paratha that pairs best with a bowl of chole. In fact chole kulche is a delicacy in North India. But unlike parathas, kulcha uses all purpose flour and hence is much softer. Curd and baking soda is used to give it a soft and fluffy texture. A potato filling is stuffed hence the name aloo kulcha. Absolutely easy to make this can be made in your regular tava on gas stove at home. Mix all of them above into a mixture. Knead the maida with all the ingredients into a soft dough. Roll it out into a small roti, place a little of the stuffing and seal the edges from all sides. Now roll it out again into a flat roti which is not too thin nor thick. I love parathas, any filling, shape or size..I guess that’s synergic with every indian. Everybody loves the paratha.A little oily, yet the taste of a paratha is second to none. You just cant beat the satisfaction that a paratha manages to score . While aloo (potato) paratha is my favourite and am sure for most indians as well, yet there are some more that manages to create a stir..The paneer (cottage cheese) paratahs and the methi (fenugreek leaves) and rajma(red kidney beans)..Give it a twist ant the very rajma paratha can qualify for a mexican quasedilla. This time, though its the paneer. I never generally make them since paneer is most often used as a main course or starter at home, not much used for partahs.but my frien gul who had come vising me fromUS a few days back, decided to treat me some amazing panee rparathas in the warmth of my kitchen, We did manage to have awhale of a time reminiscing our gud old days years back when we worked for a reputed Indian punblication ..We met a s collegues and stayed friends for life.So it was like a break for both of us, chatting away, visint the old palces that we would frequent, relishing the street food that we used to cherish then ,reminishing oir old dyas. She is afantastic cook, and she cooked amazing dishes in those 4 days of stay.One of tjem wa sthese paneer parathas..And yes, a s i learnt it is the small tricks that do wonders to any dish, really.Irrespective of all teh spice sthat might pour in, it ultimately is a combination of your skills, your stle of cookinga nd small tricks that which creates awonderful dish and sometimes just teh simplicity of the dish devoid of any spices. I ahve included my own twist her by adding grated cheese, since i love teh combination of cheese and paneer. Tated great. Now make small balls of the dough. Take one ball, flatten it a little, add in a little filling, cover and seal the edges and shape it into a ball again.Ideally the amount of filling should be equal to the size of the dough ball but care should be taken that it does not spill out. Roll it out again into a thick roti, and care that teh filling does not come out.ideally flatten it out with your hands first so that the paneer is evenly distributed and then roll it out softly. Under low to medium flame, put the paratha on the tawa. Absolutely simple and easy, this is as easy as the aloo parathas as you can see.Not much of spices or masla, the pure mix of paneer rand cheese does wonders to your cravings. Savour with your favourite pickle/chutney/raita or even a curry for a complete meal. Dal Makhani parathas are a beautiful creation out of your last meal’s leftover dal makhani that you might not know what to do with otherwise .Likewise most often I cook so much of the dal makhani that I don’t know what to do with it. Few of us will toss it off into the dustbin and some of us might just re- heat and eat them as side meals out of compulsion perhaps. You really don’t know how to dispose them off since the appeal shines off after repeated consumption in successive meals. And you either throw them off or keep consuming out of guilt of letting them go waste. Well ;then the best way is to use them to make delicious nutrient rich parathas . Rotis and Parathas are staple food for many in our country, day in and out we make them for every meal.You can use these left over subjis to pair them with your wheatflour; put in some additional spices and make them into nice ,soft tasty parathas.And really, these parathas are much more healthier at times since it features the vitamins of original dish which was supposedly a main dish for your meal perhaps.Especially with left over rajma(red kidney beans) or dal makhani( Urad Dal/black lentils), these are actually healthy, nutrient filled wholelsome parathas and very heavy.You wouldnt require anything else.. I generally make use of most of my leftover curries/subjis this way.But even while using, some dishes go better then others.Especially the rajma(red kidney beans) and Dal makahni. They go the best and makes awesome parathas.I love them, am sure you will too. These easy and quick parathas are healthy, nutrient rich and absolutely light and easy in making, fuss free. They can be your breakfast, lunch or dinner meal.You just require a side dish perhaps and replace your regular dose of Rotis or Rice. And honestly they are incredibly awesome. There is no specific thumb rule of the list of ingredients that go into these parathas you can modify them according to your taste and creativity of ingredients blended together, yet I have my own set of ingredients that I think best creates a delicious paratha. Since the Parathas already have one whole cup of dal makhani its is very filling and tasty as well. Sliced onions and a coriander-mint-curd chutney goes very well with these lipsmacking parathas. Dollops of hot butter just before serving gives you divine pleasure ,sacred to your taste buds I must say.Can be complimented by an Indian side dip of curd and mint and maybe tomato sauce as well. Now who would have thought that leftovers can be so delightful?So then, peek through your refrigerator for leftovers and transform them into wonderful rich nutrient filled parathas for your next meal. Dal Makhani parathas are simple and quick parathas using the left over dal makhani from your last meal. Blend the dal makhani with regular atta(whearflour) and minimal spices and relish these gorgeous nutrient rich parathas . In a tawa or a griddle on low flame, put the rolled out paratha. Roast them for half a minute and flip over.,apply butter on the top part while the other side is getting roasted/cooked. Cook until done under low-medium heat,pressing down the parathas while cooking for it to cook well inside. Serve with your favorite curd or pickle or even a vegetable dish. Most of the ingredients are optional except the wheatflour and the dal makhani. The dal makhani already has pretty much all the essential spices to lend the wheatflour the taste and texture that makes it up to a delicious paratha. But you need to add additional spices like the cumin powder and the dry mango powder since the spices in the dish gets diluted once mixed with the whetaflour. Hillarious as it may sound , most of my self invented receipes are born out of a shortage of a basic important ingredient .To a newer receipe ,born out of the old and the known..Well, unique in its taste, it does not mean that the new receipe falls within untouchable pallates or of unpleasent taste..Although some of my inventions haven’t turned out well in taste, few of them have workd out to give a totally new and scumptious flavour coz of either the concoction or mix of spices and they are the ones that i would love to write about. This receipe ,a quick and a very simple one actually( and many of you from India might actually think why am i even putting up this basic receipe, maybe its not worthy of being featured in a blog),originally would have taken the shape and taste of methi(fenugreek leaves) parathas,however since I did not have them in my kitchen, i had to use the dried version( kasuri methi as it is called and available in super markets from various brands).To it I added spring onions( i actually used the green stems more rather then the onions),which i had got for use in some other receipe actually..
For my international readers esp from the western world, parathas are an Indian type of bread made from wheat flour.They could be plain or stuffed .Roasted and smeared with oil or butter, they make an amazing snack, and are the staple food of majority of households in the country.They are extremely popular in India and Pakistan, the originators and have extended their popularities to certain parts of south east asia as well apart from the middle east albeit with different names. 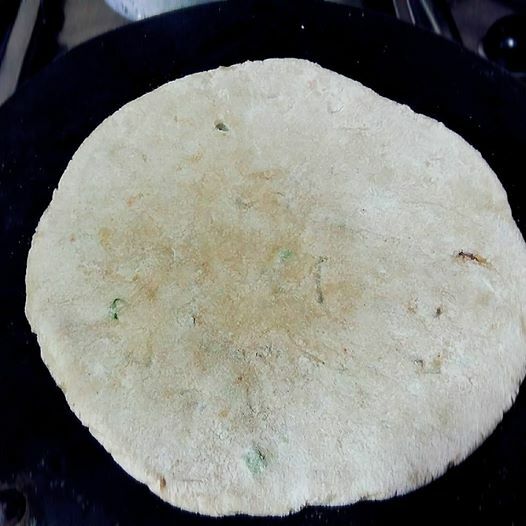 To convert this into a healthy paratha, u can use multigrain flour or mix nachni and ragi flour to the wheatflour for making the dough.In this case you will need to consume the parathas fast when hot otherwise they tend to harden coz of the addition of nachni and the ragi flours. Knead the flour with spring onions, kasuri methi, curd or water as you wish, jeera(cumin) powder,garlic, coriander powder, aijwain, salt, red chilli powder, green chillies a little oil to make it soft and warm water. Leave the dough coved with a damp cloth for few mins..This makes the dough soft. Make small balls out of the dough and roll them out into thick flat parathas. In a pan or griddle or the most commonly used “tava”, roast the paratha on both sides on low flame and start putting the ghee/oil(I used ghee, for its aroma) while turning the parathas. Once done ,keep it covered until ready to serve.Ideally parathas taste the best when hot. A new taste and a new combination, this recipe features in my blog(albeit,parathas falling in the common holiness of everyday food for many houselds) just to show that we can use varied combinations of veggies, spices to arrive at a unique tates ,away from the regular ones. So try it out these lip snacking parathas,with some dollops of butter, like the Punjabis have in India, along with curd and pickle,anytime, anywhere, a great quick snack ..As a maincourse, you could compliment it with a dish of pulpy black channas(black chickpeas).Will post the receipe of black chickpeas sometime later..